When Aaron and Stacy Franklin opened up a small barbecue trailer on the side of an Austin, Texas, interstate in 2009, they had no idea what they'd gotten themselves into. Today, Franklin Barbecue has a national reputation and several major barbecue awards. Now the authors share years' worth of hard-won knowledge and the secrets behind truly great barbecue. 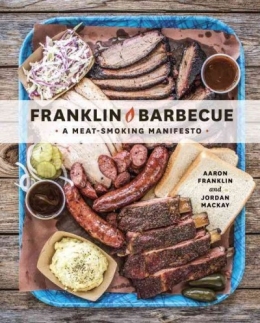 This resource for the backyard pitmaster includes chapters dedicated to building or customizing your own smoker; finding and curing the right wood; creating and tending perfect fires; sourcing top-quality meat; and of course, cooking mind-blowing, ridiculously delicious barbecue. Beginnings -- The smoker -- Wood -- Fire + smoke -- Meat -- The cook -- Serving + eating. Includes bibliographical references (page 203) and index.